This article from the AP Broadcasters' woes could spell trouble for free TV has a bunch of numbers on the costs of TV networks that I found pretty interesting. "On average, the pay-TV providers pay about 26 cents for each channel they carry, according to research firm SNL Kagan. A channel as highly rated as ESPN can get close to $4, while some, such as MTV2, go for just a few pennies." I really wish that I could just buy TV networks ala carte direct from the network rather than having to pay Comcast an obscene amount of money for 100+ channels I never watch plus the 5-10 that I actually watch. But of course we'd all like that and the cable companies know it so thats why they don't do it. "Media economist Jack Myers projects online video advertising will grow into a $2 billion business by 2012, from just $350 million to $400 million this year." "Advertisers spent $34 billion on broadcast commercials in 2008, down by $2.4 billion from two years earlier, according to the Television Bureau of Advertising." "In 1998, cable channels drew roughly $9.1 billion, or 24 percent of total TV ad spending, according to the Television Bureau of Advertising. By 2008, they were getting $21.6 billion, or 39 percent." 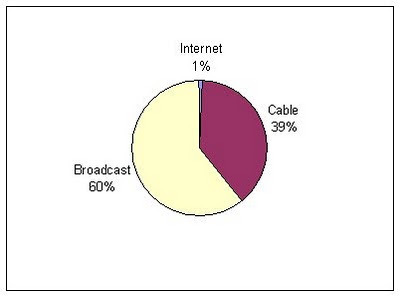 So the broadcast networks are still getting most of the ad revenue. Internet revenues are still trivial in comparison to the whole.